A mortising machine is a specialized woodworking tool used for cutting square or rectangular holes in lumber (timber). It’s designed with a motor that drives the drill through the workpiece. 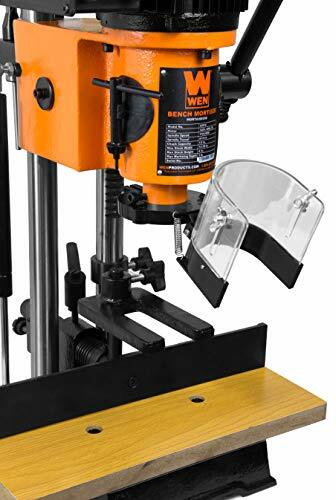 If you need a reliable and efficient tool to drill holes that will fit other accessories or pieces in your timber, you might want to invest in the best mortising machine. If you need a mortising machine, expect to learn more about them here. You will also learn about our editor’s choice, budget, and best value picks from among a group of mortising machines. There is also a buying guide herein that you can trust to help you make the right choice while shopping for the machines. The editor’s choice for the best mortising machine is the Jet 708580 JBM-5 1/2.... With 0.5-Hp and a 1,752 RPM motor, the machine balances between power consumption and the service delivery. The tool is also designed to fit a ½” chisel capacity and 4- ¾” headstroke for quality results all the time. Heavy-duty cast iron and steel construction. Long and multi-position mortising handle. Reversible column for mortising larger stock. 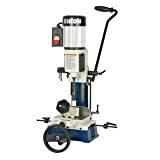 This machine from Jet Tools features a heavy-duty cast iron and steel casing which provides durability and stability. The machine also features a long and multi-purpose mortising handle that lets the user reposition the feed handle to achieve maximum comfort and easier operation. Also, the machine features a quick adjust depth stop that ensures uniform mortise depths. The powerful ½-Hp motor fitted to the machine ensures consistent smooth performance. If you’re security-conscious, the machine has a removable On/Off toggle switch. This ensures the user is safe from accidental use of the tool. The switch also prevents unauthorized use. The tool also has a dependable rack-and-pinion head adjustment which ensures the user gets accurate position control. Heavy-duty casing for increased stability and durability. Considerably lighter to be used by one person. The motor is not strong for extra thicker stock. The fence is a bit low which means fiddle applications. Onboard tool and chisel storage. The Wen Products tool is fitted with an onboard depth stop. This ensures to prevent the user from drilling past their intended distance. It also features a spring-loaded chip guard which easily flips up and down pet the need. This allows for versatility and meeting of the user’s needs. Also, designed with an onboard tool and chisel storage, the user is guaranteed of maximized organization and having the bits accessible per the need. The machine is designed with a 5-Amp motor that offers speeds of up to 1,725 rotations per minute. This guarantees ease of operation even when working on the toughest wood pieces. The tool also features a spacious chuck that accepts bit between 1/32 to ½ of an inch. This offers the user versatility to work on any project. With an adjustable feed handle that rotates freely, the tool ensures to prevent collision with the workpiece and springs back into position once the user selects their optimal start and stop points. The tolerance is far too lax in the bushing. Dovetail column ways with adjustable stop. The Rikon Power Tools benchtop mortiser features a sliding X-Y axis table which ensures it offers precise positioning of the workpiece. The tool is also built with a front clamp that pushes work against the cast iron rear fence. The clamp also acts as a hold down making work easier as the user can concentrate on the work. The machine is also designed with a stabilizer that is filled with gas. This aids in the control of the chisel’s upward and downward movements. The machine also features an adjustable stop which offers the all-important consistency while cutting multiple mortises. Sturdy housing for increased stability. The handle is a bit weak and uncomfortable. Chuck capacity: (5/8" max dia. shank) 1/4" x 1/4" 5/16" x 5/16"; 3/8" x 3/8"; 1/2" x 1/2"
Modifiable height and 180 degree-rotating head. The mortising machine from Delta is designed with a large cast-iron base with a center through hole which makes focusing easy. The machine also features an easy and open access to the drill chuck which ensures easier and quick bit changing. Also, the tool presents a height attachment feature which adds 1-3/4” of additional capacity under the head. The machine also features a multi-position feed lever and gas-filled head stabilizer. These features ensure it guarantees smooth and steady operation. Also, if you’re looking for versatility, the Delta machine would be ideal for you. This is because it features an adjustable height and rotating head that allow you to adjust and rotate them respectively until they fit your specifications. At 120-volt consumption, it offers a steady stream of power. Sturdy and multi-position feed lever. Poorly designed with lack of attention to detail. Chuck capacity: 5/8" max and 1/2" minimum. 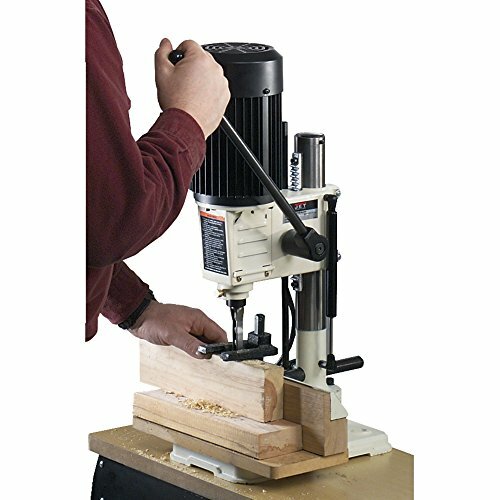 The Woodtek hollow chisel mortiser features built-in and adjustable stop rods. These are efficiently fixed to enhance repetitive mortising. The machine is also fitted with a gas-filled head stabilizer which ensures it offers smooth and precise control. The tool is also designed with a powerful 6-Amp motor which offers speeds of up to 1,725 rotations per minute. This guarantees speed and ease of operation. The fence needs a bit of adjustments. The depth adjustment is a bit primate and requires constant manual adjustments. Not packaged with bits and chisels. Among the machines that one can use for drilling holes in timber workpieces are mortising machines. They are designed to offer the user, be it a professional or a DIYer, the freedom to drill holes of their desired shapes on any workpiece. Even though they exist in different models, their goal is the same and that is helping you get a hole on your timber workpiece to fix any accessory you want. The first type is the square chisel mortiser. Also called a hollow chisel mortiser, this type is similar to a drill press for drilling holes in wood in most aspects. The main similarity is that it combines the action of a drill bit and the cutting power of a four-sided chisel in the center. A square chisel’s drills are versatile and can be fixed to a normal drill presser using mortising attachments. The horizontal mortiser, also called a slot mortiser, is a more recent innovation in the family of mortisers. It is designed to incorporate a router that is mounted statically on the side with the workpiece which is clamped to a multi-axis sliding surface like a table. This mortiser produces mortise and tenon pairs as well as floating or loose tenons. The floating tenon involves pieces of wood joined together and have aligned mortises. The aligned mortises are cut and separate pieces of wood are milled into fitted tenons. A chain mortiser is designed for cutting larger mortisers. The examples of such mortisers are the ones used for timber farm construction purposes. A chain fitted with cutters like a chainsaw rotates within a frame that is clamped to the workpiece. The chain is then successively plunged into the workpiece and the required volume is mortised. The tips below will help you get the most out of your benchtop mortiser and ensure you operate it safely. For a firmer working relationship with your mortiser, you should at least try and add a hold-in device that will secure the workpiece into place. Such devices can be included with premium machines but even with a budget option, you can use makeshift ones. You can use accessories that have the ability to hold the workpiece and limit movements as you work. 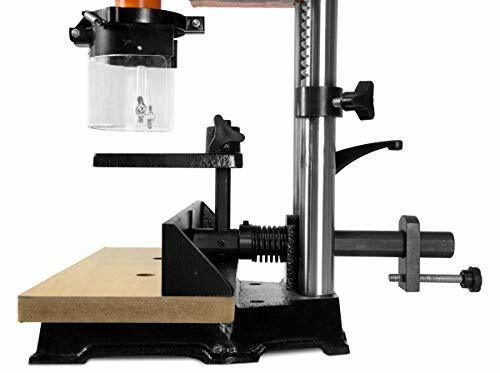 The accessories should be fixed to the cast-iron base of the mortiser and space will be created to fit the piece you are drilling holes into. This is a little but handy tip to help you save the time. When you cut your mortises, it is advisable to set the depth stop in a way that it will bore into the wood slightly deeper than the tenon’s length. Having a deeper boring will help you avoid cleaning up the bottom of the mortise for the tenon to fully fit into place. The square hollow on your mortising machine is designed to work in tandem with the drill bit that’s located inside. This is a simple principle and the bit is used for removing the waste elements when the chisel pares away the corners and edges. What is more important is to ensure you have the right spacing between the bit and chisel tips. The overall workspace while using a mortising machine is an important consideration since it determines whether the workpieces will fit on it. When you’re looking for the best mortising machine to buy, therefore, you should consider one that allows for or has a large work surface to support your work without needing alternative rigging. The motor size is measured by the amperage and rotations per minute. A good mortising machine is one that combines both to offer seamless operation and give the desired results. When you are shopping for one, therefore, you should ensure to get one whose amperage and RPMs allow for enough power under the hood. Among the most crucial factors determining the operations of a mortising machine are the accessories. Such accessories include the bit changes and chisel capacity. They also determine how the results will be which calls for due diligence and a careful consideration of the same while selecting a machine of choice. How long is the feed lever of the machine that you are looking at? This is a question you should ask too before settling on a specific machine. A good feed lever should be long enough to ensure the user gets as much leverage as possible when they lower the larger diameter bits into a workpiece. The depth of the machine you’re buying should be easy to adjust. It should also not flex under pressure and should also be accurate. If you’re looking for efficiency then, you know what to look for in a mortising machine. The other consideration is how far the mortising machine’s head travels. This is also called the stroke of the machine and means how far the bit travels along a vertical axis when the lever is pulled. If time and efficient are your ultimate considerations, you should not compromise or fiddle with the extent of the stroke. When you’re looking for a mortising machine, the fence system should also guide you into making the right decision. The larger the system the better. You should also consider a fence system that is at least flat across the face or at least 90 degrees to the table. Our editor’s choice for the best mortising machine is the Jet 708580 JBM-5 1/2... The model guarantees the user a blend of efficiency and precision all thanks to its 0.5-Hp and a 1,752 RPM motor. It also guarantees a balance between speed and effectiveness for desirable results. If you’re operating on a tight budget, the WEN 43012 5-Amp Cast Iron... would come in handy. It also guarantees speed and power with a 5-Amp motor and 1,725 rotations per minute. Alternatively, our best value pick, the RIKON Professional Power... can serve you equally well if the budget is not an issue. It also boasts of a 0.5-Hp motor and speeds of up to 1,750 for optimum productivity.